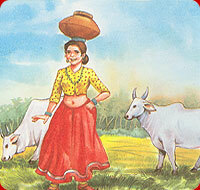 A Milk-maid had been to the meadow to milk her cows. Now she was returning home with a pail of milk on her head. She thought, "I will make cream and butter out of this milk. Then selling them, I will buy eggs. and when they hatch, I shall have a good poultry farm." She further thought, "I shall sell some of my fowls and buy a fine dress. Seeing it on my body at the fair, all the boys will admire me. But I will turn them away just tossing my head at them." Lost in day dreams, she forgot about the pail on her head. 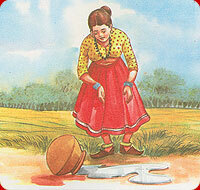 She tossed her head with a jerk and the pail of milk came tumbling down. it was broken and all the milk got spilt. "Dear O dear !" she cried, "I have lost my all." MORAL: Don't count your chickens before they are hatched.